Our Study Abroad and Exchange program embodies our commitment to forward thinking education. We rank among the world’s best universities and continue to improve our international standing. In the largest and most credible world university rankings, we are ranked in the top 350 - placing us in the top 2% worldwide. Griffith has over 2,500 undergraduate and postgraduate courses to choose from. You can select courses from most study areas, programs and year levels. However, some study areas are restricted or are not available (see below). Specialised Trimester is the perfect way to demonstrate expertise in a particular study area. Students choose three or more courses in a chosen study area. The Community Internship course allows you to earn 10 credit points while gaining work experience through placement with a not-for-profit organisation. English + University students complete Griffith English Language Institute's award winning Direct Entry program then begin their Griffith University Study Abroad program. Specialised Trimester is an opportunity for students to gain recognition and experience in a specialised study area offered by Griffith University. The certificate is awarded to students who successfully complete at least 3 courses from one of the listed specialisations. A typical full-time study load is four courses per trimester, students have the flexibility to include a course outside of the specialisation to either complement or differentiate your trimester abroad. Students must meet any listed pre-requisites and ensure your course selection is offered at your selected campus and trimester intake. 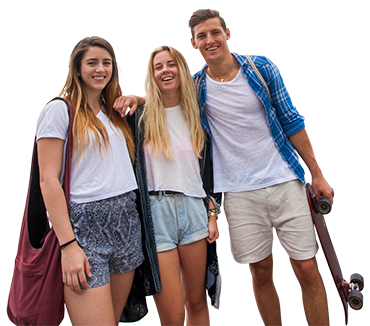 English + University students complete Griffith English Language Institute's award winning Direct Entry program then begin their Griffith University Study Abroad program as a confident English speaker, listener, reader and writer. As part of your study at Griffith, students have the opportunity to participate in a Community Internship as part of their course selection. Community Internships allows students to gain real-world experience with a not-for-profit organisation and earn 10 credit points. The Service Learning team will find a suitable internship in your chosen study area. Selecting and enrolling at Griffith is easy. Keep these guidelines in mind when choosing your courses. How many courses can I study? You must enrol in a minimum of 30CP to comply with student visa requirements. If you hold a student visa, you can only study online for one third of your total program. This means that if you are enrolled in 30 credit points (cp), you can only complete one 10cp course via online study. What's the course equivalent at my home university? You will need to meet any prerequisite requirements to be eligible to enrol in courses. Search the degree finder to view the specific entry requirements of your courses. You can enrol in courses once you have accepted your offer, been issued your Certificate of Enrolment (CoE), enrolment has opened and you have received your Welcome to Griffith email. Please note we do not enrol you, it is your responsibility. Undergraduate students who are enrolled in an Engineering or related degree may be eligible to undertake 4604ENG Internship Research Project and work with a Griffith academic supervisor to complete a research internship.